the scent of green bananas: name that fruit! : you say star apples, star fruit, i say huh? name that fruit! : you say star apples, star fruit, i say huh? this edition of "name that fruit!" should rightfully be called "name those fruits" as you can see there are actually two here. durrrr. however, both have been referred to as "star fruit" or "star apples" to me as both have star patterns of sorts when cut through. i grew up not really knowing what was called what in english, and still never get it straight. of course, this confusion is easily sorted by just referring to them by their latin names, but who really does that, ever. "johnny, i'd like you to meet my favourite passionfruit, just call him ricardo." let's start with the simpler one, that being the oblong, angular yellowish fruit, from the Averrhoa carambola tree. in english it is named the carambola, but colloquially known as starfruit because when sliced through, the star shape is more than evident. i rather do prefer 'carambola', as it's more like an epithet than a name (¡ay, carambola! ), but perhaps its constitution doesn't really deserve that. it is crunchy, cellulosy, sweet, and juicy, with a taste and texture reminiscent of an asian pear, but somewhat more delicately so, yet with a more astringent bite (in fact, it is related to the distinctly sour camias). another name for it is the coromandel gooseberry, which is a mouthful, but perhaps matches its ornamental beauty and oddity best. the round, greeny fruit with the white flesh is Chrysophyllum cainito, and interestingly, the only english names i could find for it were both confusing. it is either known as a star apple--as is the carambola--or custard apple, which annona, cherimoya, and sweetsop are called as well. wtf? surely these fruits, while similar, are different enough to come up with more than one name for them; after all, a raspberry is a raspberry and a blackberry is not (although, come to think of it, sometimes a blackberry is a mulberry, a marionberry, or a crutch of a device for internet addicts the world over....). the star pattern is vaguely detectable in the seed pattern (frankly, i think "star fruit" as a description is pushing it a little).it is fleshy, exceptionally sweet, milky, and sort of unsettlingly creamy; in fact, when i was younger my mother used to refer to this as ice-cream fruit. not that it ever fooled me. but it did stick with me. 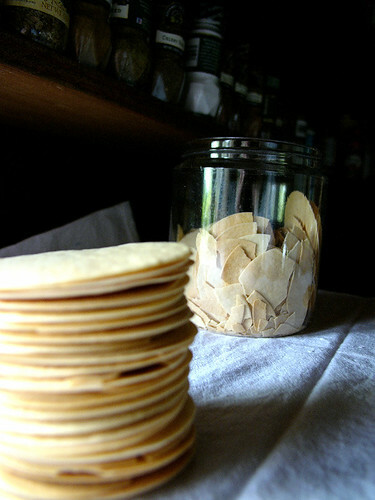 armed with this notion, and a few galletas-- an arrowroot-based (? i have no idea.) 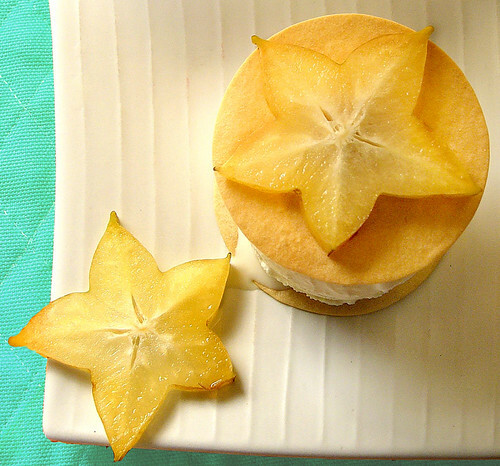 sweet wafer from the philippines--and a lot of time on my hands, i decided to try to make star apple ice cream. i didn't want to overwhelm the delicate flavour of the fruit, so i just add full-fat milk and some sugar syrup to the de-seeded pulp, and froze the lot. after running it through the blender a few times (of course you can use an ice cream machine), i had a credible sherbet on my hands. the only problem is that the star apple really tastes most like sweet milk anyway; i couldn't tell if i just overwhelmed the flavour altogether, or if it was a successful run. the texture was not quite of ice cream, however; the pulp made it icier, and ever-so- slightly gummy. no matter. it was quite lovely, sandwiched between two galletas, and served with slices of starfruit for contrast. Posted by santos. This entry was posted on 20060313 at 2:46 PM You can skip to the end and leave a response. i miss it. 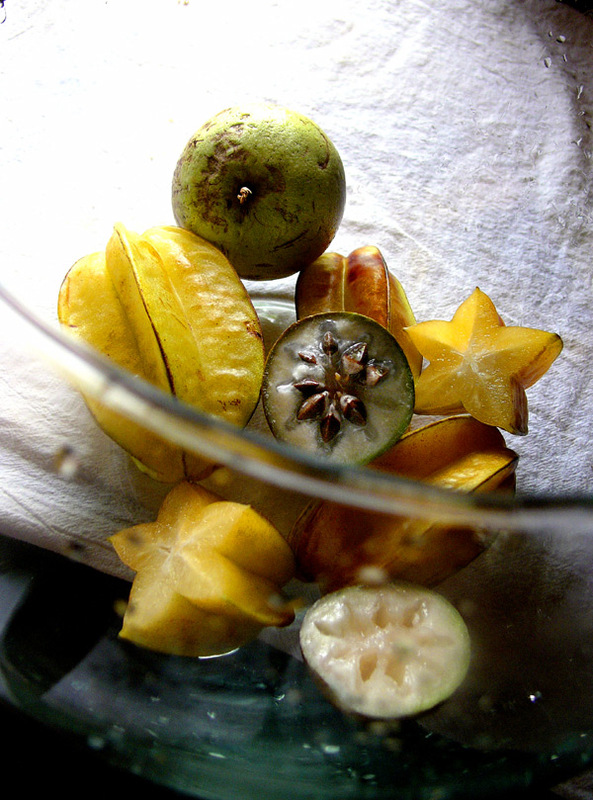 kaimito and star fruit. I always thought starfruit was the obviously star-shaped ones - I hadn't seen the other one before. What an unusual and pretty dessert! I grew up calling it star apple. And I'll probably call it that until I die.. nice pics! I've always called the star-shaped ones star fruit. Carambola makes me think of nuts. The other one I'm not familiar with, though I once ate a fruit called soursop. Your ice cream sandwich is beautiful! I'm familiar with the yellow fruit, but not that whats-his-name green fruit. Is the green one normally eaten out of hand? growing up with People Power 1 on my mind, the first that came to mind was "balimbing" and for the round fruit, star apple. I know the kamias but not the other one. I don't eat a lot of fruits anyway. But once again, you've amazed me with your photos. =D. Btw, I went to Cardinal Ceramics already and blogged about it too. I put a link to your blog ha. Thanks! hi anon, i miss it when i'm not here, and when i'm here i totally ignore them. typical. anita, the other one seems to be a little harder to find. i've never seen it on the mainland, but then again, i've never looked for it. anon, soursop is similar in texture to the sweetsop, but the sweetsop is just sweet--none of the sweet-soury taste. cathy, what-his-name is usually eaten out of hand, yes. i think cooking it probably destroys its integrity, and it's so pulpy, you really can't make a juice out of it. mila, i'm not sure i get the people power reference--why 'star apple' for the round one and not 'caimito'? a taglish thing? hi ana, i'm sorry i didn't get back to you--it was crazy nuts this weekend. i love your choices though! really lovely arrangement. hi j, i don't really like the stringiness that older fruit can sometimes have, but there's something about certain tropical fruits that i'm quite partial to--usually it's the 'throwaway' stuff that we used to find in the boonies growing wild; the flavours weren't particularly strong, they all seemed a bit grassy, and the most interesting thing about them is the texture. i guess it's because i don't come across those textures with cultivated fruit. had never eaten star apples before I got to Hanoi and since then, I'm a convert, I love its sweet custardy texture and by the way, over there in Vietnam, they are called "milky fruit"! balimbing - a politician who transfers to another party just to guarantee himself of a government seat. I remember using this on pizza. it's odd, but when baked, the tangy flavor mellows down...adding zest to an average joe pizza. caimito - when in season, this big woody tree can produce zillions of fruits at one time. yup, you are right...this fruit is ignored because of its abundance. and it's either you eat the fruit plainly....or make it to an ice cream. hey, why not add it to an average joe pizza???? maybe it would also mellow down and add a heavenly zing to it! yummy! ah, salamat for the balimbing/political reference. i was wrapped up in...plastic...for most of the 'eighties and 'nineties, didn't pay close attention to philippine politics. hm, don't know about the caimito pizza though. what about in a salad? Santos, your blog never ceases to amaze me! Your pictures are wonderful! I am so jealous of the all the fruit and lovely things to eat. I've never seen that fruit before but I can almost taste it! isn't ates called sweet sop? The common names really throw me. All I know is that I really miss the sour sop, sweet sap, mountain apples, sugar cane, pumpkin tips in coconut milk, starfruit etc.. I could go on forever. rachel lynn, i hope you can get to guam sometime--it's not that far from korea :) you can try all the different fruit here. gia, actually now i'm totally confused myself. you're right about the common names, they can be totally misleading. oh- em- gee!!!! galletas and star fruit!!!!! i had forgotten how much i love them so much! youve brought me back to manila! I grew up knowing the round one as "Philippine Star apple" and the other in Chamorro "bilinbines"